Trump Has A Chance To Pull U.S. Out Of Climate Accord : The Two-Way During the campaign, the president-elect said climate change is not real, and he rejected last year's international agreement to cut greenhouse gases. France celebrated a milestone in the Paris climate change agreement last week by lighting up the Eiffel Tower in green. President-elect Donald Trump could pull the U.S. out of the deal. During his campaign, Donald Trump called climate change a hoax. And he vowed to abandon the Paris climate agreement signed last year by President Obama and almost 200 countries. It probably wouldn't be hard for Trump to dump the climate deal. 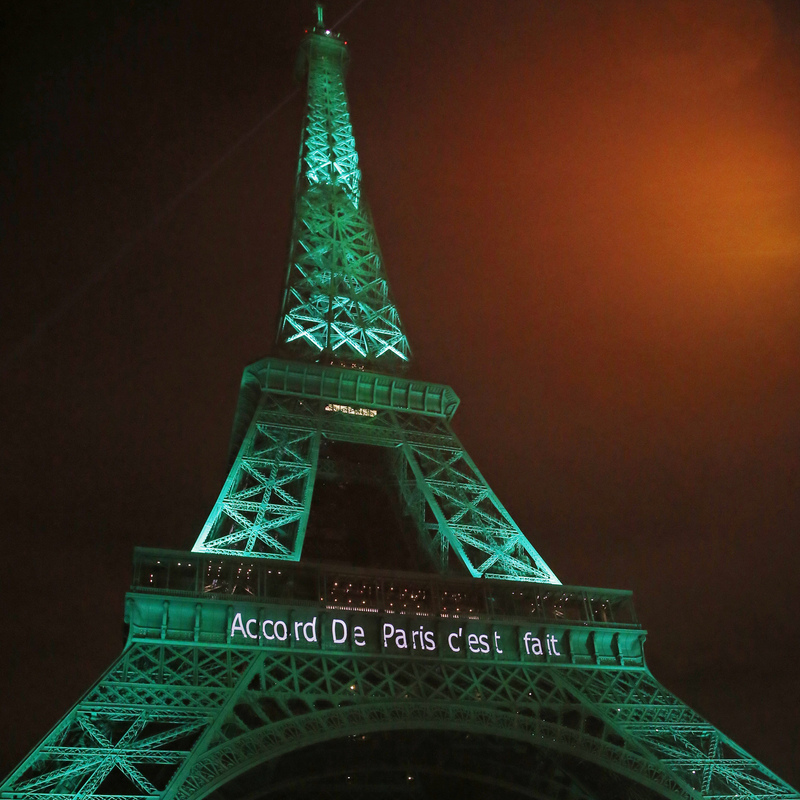 In Paris, the world's nations pledged to reduce their emissions of greenhouse gases. But the pledges are voluntary. And Jason Bordoff, a former energy adviser to the White House and now with Columbia University, says that gives Trump an opening. "If a country wants to just walk away from its obligations," Bordoff says, "there's little recourse for the rest of the world other than diplomatic pressure, I think." Environmental groups argue that the rest of the world could soldier on without the U.S. But Bordoff notes that the Paris deal starts with modest reductions in emissions — well below the amounts scientists say are needed to avoid the worst effects of a warming climate. It was simply too difficult to get buy-in on tougher cutbacks from many developing countries in need of cheap energy. So the idea was to come back in two years and toughen them up. But Trump may not join that effort. "So I think it has quite a damaging effect if the U.S. were to try to walk away from its commitments, in discouraging other countries in being as ambitious as they might otherwise be." Another potential threat to the accord is a $100 billion-a-year fund promised to developing countries if they joined the Paris deal. If the U.S. backs out of that, it might look to developing countries like a bait and switch. Or, instead of walking away from the Paris deal, Trump could simply drop Obama's domestic climate strategy. The centerpiece is the Clean Power Plan, a federal rule that would require U.S. power companies to reduce emissions. Megan Berge, an energy expert with the Baker Botts law firm, says the Trump administration might simply gut it: "Effectively eliminate the rule altogether," she says, "or potentially transform the rule into a very different animal. ... They have options to go that road." But even if Trump walks away from the Paris deal, market forces are already reducing emissions. "Thanks to smart investments and technological innovations," such as cheaper wind and solar energy and cheap natural gas, "we've already started on a clean energy transition," says Elliot Diringer, who is with the Center for Climate and Energy Solutions. That's a transition that began well before the Paris agreement. In fact, Diringer says, since 2005, without benefit of joining any international agreement, the U.S. has lowered its greenhouse gas emissions from power plants by 21 percent. An earlier version of this post misspelled the name of Megan Berge, an energy expert with the law firm Baker Botts.